Friday April 12, 2019-The Orange Democratic Movement (ODM) party has once again reiterated its sincerity and seriousness with regards to its current association with President Uhuru Kenyatta. 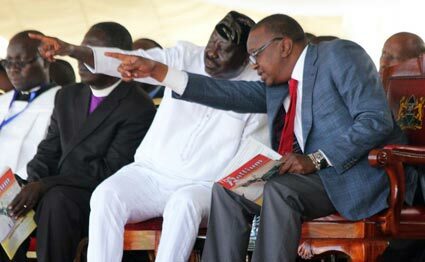 In a tweet on Wednesday, the Raila Odinga-led Orange party insisted that it will continue working closely with Uhuru's ruling Jubilee Party, in a bid to realize the set goals. ODM added that it will fully rally behind the Head of State as he seeks to realize his Big 4 agenda, which revolves around food security, industrialization, health and housing. It further declared its full support for the president's anti-corruption fight, pledging its support to ensure that the menace is kicked out of the nations once for all. The party added that the fight must be won and whoever is found culpable should be dealt with, regardless of their position. "We shall continue to work with the Jubilee Party to help President Uhuru Kenyatta achieve his big 4 agenda by fighting corruption, ensuring there is adequate food and free medical care for all. Corruption must be fought at all levels and MUST be won regardless of who is found guilty," the ODM party tweeted.